Fortunately, from now on, I expect to be able to spend more time on my blog. We have finally found a new aupair who is helping me out with the triplets during the day. Having her around should definitely allow me to spend a few hours a day on my website and the many exciting collaborations that I am currently working on. 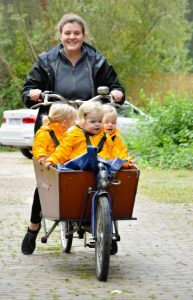 Also – more importantly – I will be able to leave the triplets at home when picking up Bas and Julie from school, which should at least spare me from having the usual nervous breakdown trying to manage five kids in a crowded school yard! Let me take you back a few months when Julie and Bas started to go to primary school. Every morning, Jorn would bring the twins to school and in the afternoons I would fetch them. The last part is easier said than done. In order to be able to leave the house to pick up the twins from school, I would need to take the triplets with me. This meant I had to wake up the triplets from their afternoon nap, dress them, give them a drink, put their shoes and coats on, put them in the car one by one. If everything would go as planned (which obviously would never be the case), I would manage to arrive at school on time. Upon arrival at school, I had to take the huge – and way too heavy – stroller out of the car and put the triplets in one by one. After fetching the twins I had to do the same thing vice versa only with two (very tired) children added to this whole circus. Seconds after I had put the leashes on and started walking towards the schoolyard, it happened… Faye started running directly into the schoolyard (enthusiastically), while Hannah had decided that she wanted to go straight back to the car and started screaming. Meanwhile, Cécile had stopped walking entirely… no movement, nothing. Eventually, I had to pick up and carry Cecile, while holding on to screaming Hannah on one leash and pulling back enthusiastic Faye with the other leash. As a result, Faye fell and started crying too. I hadn’t even entered the schoolyard when I saw Julie walking out of the school entrance, crying (for no reason by the way) and Bas with a very sad face because he had bumped into something on his way out. Then, heading back to the car was the worst part. You know when your kids go to a new school, you want to make a good first impression with other parents, right? BIG FAIL! I really looked like a maniac; I had five crying toddlers all walking in different directions. The leashes were completely tangled up as a result of which the toddlers were tumbling all over each other. Smiling politely whilst casually ignoring my hot flashes was really all I could do as I was trying to make my way out of the schoolyard. Now, we are lucky to have Leana living with us, which allows me to divide part of the many tasks. For instance, Leana will take care of the triplets when I pick up the twins. 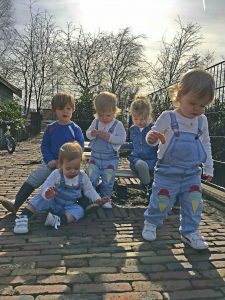 Also, during the day she takes the triplets out for walks to the farm or a park and entertains them with handicraft projects such as drawing and painting. It gives us all much more peace of mind now that we have an extra set of hands living with us. 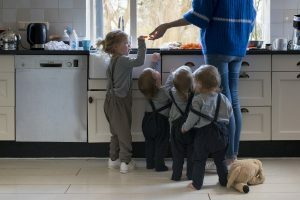 For those of you who are exploring the idea of having an aupair instead of other childcare, I can highly recommend the service of House o Orange Aupairs! To us it is so important to have an experienced, service oriented aupair agency. We have hired other agencies in the past for our former aupairs, but their service did not even come close to the service of House o Orange Aupairs! House o Orange Aupairs has a great screening program, they work very accurately and fast and they carefully prepare the aspirant aupairs on their new life as an aupair in a foreign country. Also, they take care of all the administration (e.g. visa application, risk insurance, health insurance ,etc) which is quite a hassle to do on your own. As very busy parents we would definitely recommend to choose the efficient way, and let House o Orange Aupairs find the most suitable aupair for your family. They do it best! People who know me well know that I am not a big fan of dolls. As a child I really did not know what to do with a doll except for cutting her hair, which was usually a once in a doll’s-life experience. Nowadays, my daily conversations consist of at least 20 percent doll-talk. And this percentage will probably increase by 60 percent in the upcoming years. 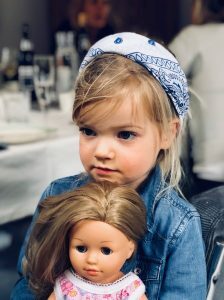 Julie has a doll, her name is ‘Dot’ and she treats her as if she is her own daughter. I sometimes feel as if she is doing a better job as a mom than myself. 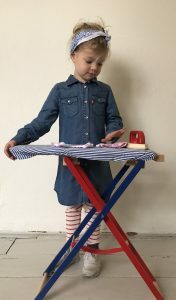 She can stay in her playroom for hours talking to her doll, feeding her, changing her nappies (every five minutes) and changing and ironing her clothes. Every set of clothes has its own story. A bathing-suit can be worn to swimming class, a dress with marine-stripes is for a glamorous boat trip and of course she has pyjamas for bedtime. The pyjamas for bedtime are extremely important to Julie. Every day before we take the children upstairs for a bath, Julie goes into the playroom to undress her doll and put on her pyjamas. A few days ago, she was busy with this whole changing ritual when Jorn called her and told her to come upstairs immediately (she had been ignoring him for about ten minutes already, so his voice sounded a bit annoyed). Julie started crying and went completely nuts. I asked her what was wrong and she told me while sobbing: “Dot is not ready for bed, I didn’t have enough time to put her pyjamas on”. So, in order to avoid a big drama I immediately said: “No worries, I will take care of her when you are in bed”. Julie went upstairs and pointed her finger at me when she was halfway up the stairs: “Make sure Dot is dressed for bed properly, she can’t stand the cold”. And up she went. Now, you might think: “Ah, well, she’ll probably forget about it”. No! Trust me, Julie doesn’t forget important things like these! So, after bathing all the children, putting them in bed, reading them a story, singing them a song, folding all the laundry, I finally went downstairs. And there I was, tired and hungry (we usually have dinner when the children are in bed) standing next to our changing table with Dot in one hand and a diaper, a romper and her pyjamas in the other. One might think I should by now have enough experience to finish the job in a blink of an eye. However, it took me at least 15 minutes to get Dot dressed and to put her in her tiny doll bed! Trust me, it really takes a professional to put on these diapers, rompers and pyjama’s: nothing really fits and the doll doesn’t exactly cooperate. Jorn started laughing when he saw me struggling with the fake diaper. He mumbled: “I knew you had a secret love for dolls after all!”. Outfit Julie: Levi’s Shirt Dress and Tiny Cottons Leggings. Find it on the Melijoe website by clicking here. Recently, we had the honour of welcoming Gonda Meurs into our house. She is an award winning photographer who takes documentary style pictures that tell real stories (Check out her website). She stayed with us during an entire day from 8AM until 8PM to take pictures, capturing ‘A Day In My Life’. I am happy to share a selection of this amazing photoshoot with you here! Whenever I tell people about our family ‘composition’ (I like to see it as a piece of art), I receive the craziest responses. I will be compiling those in a soon-to-be-posted story, but for now, I thought to share with you my mother’s response to the news of us expecting triplets, which I believe is priceless. Yes, mom, I’m sorry but your response was totally crazy! Let me take you back to November 2015, when I had my first sonograph. 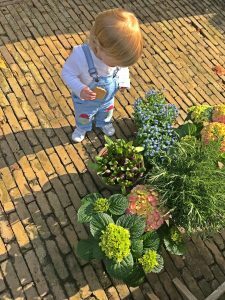 Jorn and I had dropped off the twins at my parent’s place – who also happen to be our neighbors – before going to the hospital for the first sonograph. We were obviously anxious to find out what was going on, and were also slightly nervous because I hadn’t been feeling well at all. Well, within 30 minutes after dropping off the kids, Jorn and I received the incredible news of me carrying triplets. This was obviously an amazing moment, that I will be telling you more about some other time. Haha, I’m laughing out loud while writing this down because her response was totally insane! My mom continued: “No, it’s not true, this can’t be true”. She raised her voice and started panicking. “MANON IT IS JUST NOT POSSIBLE, how are WE going to handle this?” (I especially like the “WE” part in this). 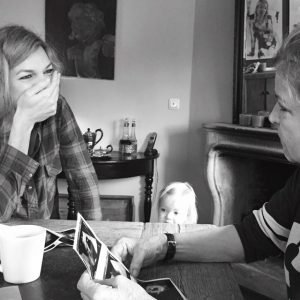 She called up my dad – very agitated by the way, as if there was someone in the room to blame for this – and the only thing she said was: “Yes, everything is okay, yes, she’s fine… There are three, three babies!” and she hung up. I can only imagine how confused my dad must have been after this bizarre phonecall. So, after drinking a cup of tea and me showing my mother the sonograph (see picture), Jorn went back to work and I took the twins home. My mom didn’t talk about the pregnancy for two weeks straight. She was in complete denial. She didn’t ask how I was feeling, didn’t ask about our doctor’s appointment, she just continued her daily life pretending that nothing had happened. I thought it was a rather strange way of acting but I also found it hilarious. I know it was just because she was so worried about me and – to be fair – there were good reasons to be worried. Eventually, she recovered from her stress (to some extent) and proved to be a great support during the remaining part of the pregnancy, and she still is today!